Here you will find an introduction to TRB Garden Solutions and what we can offer you in the way of garden services and why we stand out as the business of choice within our industry. As a company we can and do provide a quality standard of work with an exceptional level of customer focus. At TRB Garden Solutions we pride ourselves on our politeness, honesty and the quality of the work we produce. We understand the pitfalls many can find themselves in when trying to find a reliable and honest business to help with their garden projects. We can provide you with a large selection of services so can be used as a one stop shop for every aspect of your garden. If you are disappointed with the current appearance of your garden, or perhaps you have just moved in to a new property and the garden needs some attention. Below are some of the garden services that we can offer our customers, we welcome all size projects and treat each project with the same amount of care and attention to detail. 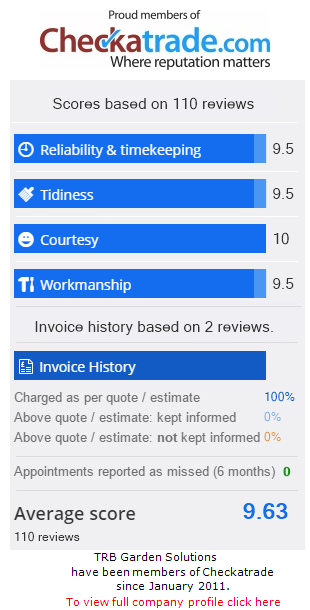 TRB Garden Solutions is also a proud member of Checkatrade.com if you would like to read through our customer reviews please click here. TRB Garden Solutions is fully insured with 5 million public liability and 10 million employers liability. We are Surrey police vetted and continue to provide Fencing services on residential and commercial properties throughout Surrey. If you would like more information on how we can help transform your garden, then please feel free to get in touch today. We are always happy to help and strive towards providing a professional and high quality service every time.